I’ve been using an iPhone for a few years, but I’ve always been curious about Android. Not because I didn’t like my iPhone, but I wanted to know if I was missing anything. I’d seen how Android works when friends showed me their phones. But given the cost of smartphones and tablets, it wasn’t worth getting an Android device just to play around with it. But then, a couple of months ago, Motorola released an Android smartphone—the Motorola Moto G—at a low enough price that I was tempted to get one, just to see if it might be better. I decided to take the leap, and here’s how I fared. I got the Moto G for £130 (about $200); it’s now available in the US for $179. I won’t go into details about specs: it’s a phone and it runs apps. The only technical point to highlight is that it offers a mere 8GB of storage, with only 5.52GB of that available to me; the rest is commandeered by the Android operating system and apps. I don’t use the phone for music or videos, so that storage is enough for me, but for some people it could be a deal-breaker. (There is a 16GB model for not a whole lot more.) The Moto G also came with an additional 50GB of Google Drive storage for a year, on top of the standard 15GB—much more than iCloud’s measly 5GB. Initially, the Moto G came with Android 4.3, a.k.a. Jelly Bean, but was upgraded to Android 4.4 KitKat in January. One advantage of this phone is that it is unlocked: there’s no carrier-installed cruft to worry about. It’s a stock Android distribution, with a couple of Motorola apps. As you’d expect, a phone like this is very Google-centric. Just as an iPhone is hooked into iCloud, many of the Moto G’s apps are dependent on your Google account. So if you have an aversion to Google, you’ll be limited when using Android; if not, you’ll have access to all sorts of features and content. 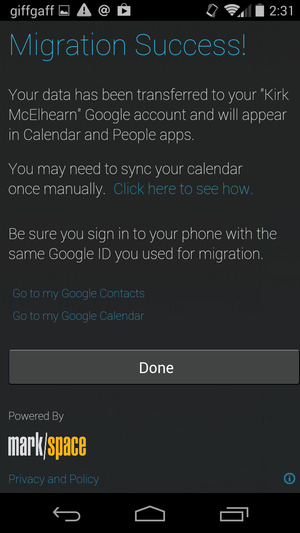 The Motorola Migrate app helps with bringing over contacts data from iCloud. It wasn’t too difficult to set up the phone, even using my existing data. There’s a Motorola Migrate app, which pulled my contacts from iCloud, to get me started. You don’t need to use Gmail; you can easily set up your iCloud email account, or any other email account, though you’ll need to enter the server information manually. Syncing contacts and calendars is a little trickier, but it works. I grabbed two free apps—CardDAV-Sync Free Beta for contacts and Caldav Sync Free Beta for my calendar—and they managed to get things in line. If you use Microsoft Exchange, that’s doable, too. I couldn’t directly migrate my Safari bookmarks, but if you already use Google Chrome on the desktop, your browsing data will sync; same goes for Firefox. (I could have imported my Safari bookmarks to Chrome and sync them, if I’d wanted to.) Google offers some useful instructions on how to sync your Google account with iOS. While Android certainly requirements some adjustments for a die-hard iOSer like me, most of what I needed to do was easy to figure out; the way you control Android isn’t that different compared to the way you work in iOS. I won’t get into the who-invented-what-first debate, but the differences are minimal. It only took a day for me to feel comfortable. All that said, there are a number of differences worth discussing. Android's general look and feel reminded me of Windows XP more than anything else. General look and feel: Compared to iOS, Android looks a bit like Windows XP. Icons aren’t as refined, and the interface feels clunky. But you get used to that pretty quickly. One thing I didn’t get used to: I dislike the use of white on black text in the Settings apps; it’s not always easy to read. Getting around: There are three buttons at the bottom of the display. On the left is the Back button (which goes back to the previous screen, even if it was in a different app). I find this very useful, and it’s much quicker to navigate than in iOS. The button to the right is the application switcher. On iOS, the windows scroll horizontally; on Android, they scroll vertically; this actually allows you to see more windows at a time. Point goes to Android. And the middle one is the All Apps button, which shows all your apps in alphabetical order; this is very handy, as it shows apps even if they’re buried in folders. Moving apps: I find it easier to move apps from one screen to another on Android; you can leave empty spaces anywhere on the grid. However, you can choose to hide some apps, if you wish; those you hide are then accessible only via search or by tapping the All Apps button. 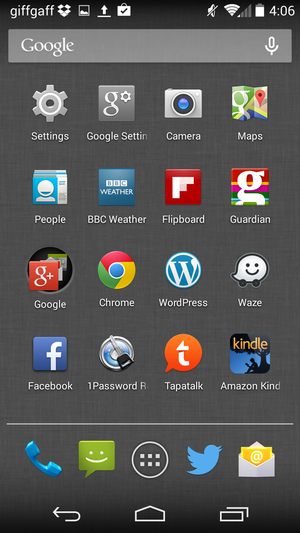 So you need to take some time to browse all your apps, and decide which ones you want to make visible on a home screen. Also, it's possible to put a given app in more than one folder; try that on your iPhone. 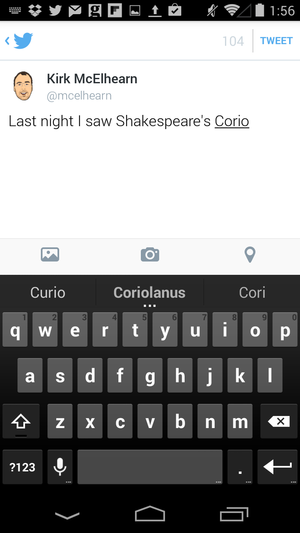 Android's typing suggestions are a lot faster than iOS's auto-complete. Typing: Android offers two nice typing features: One is swipe typing; you drag your finger on the keyboard to type words. I haven’t gotten the hang of it, but I’ve seen people type very quickly with this method. The second is typing suggestions that appear above the keyboard, which can make typing a lot faster than iOS’s auto-complete. Bundled apps: Both OSes have a full range of bundled apps; I didn’t find anything flagrantly missing in Android. However, I did find that, when looking at a Google Android Quick Start Guide for KitKat that I didn’t have some of the apps mentioned, or had different versions. Such inconsistency depends on the specific device you have, but it’s where Android really loses out to iOS. 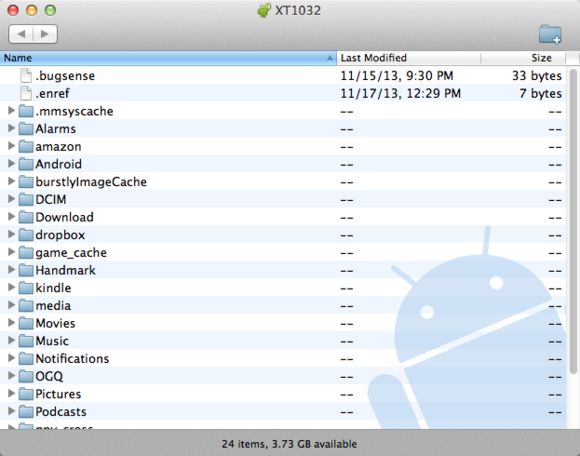 That fragmentation makes it hard to find exactly what you can do with your Android device. While most apps work on all recent devices, some work differently, or not at all. I also saw some settings mentioned in the Quick Start Guide that I couldn’t find on my phone. Voice control: Android doesn’t have Siri, but there are plenty of voice actions that you can use to have the phone do things for you. Third-party apps: For the most part, third-party apps look exactly the same on Android as they do on iOS. I tried a number of well-known apps, such as Flipboard, WordPress, Waze, Evernote, Firefox, Skype, Kindle and many others. The only real difference is the screen size: I didn’t have to learn any new tricks to use them. Still, there are many iOS-only apps that I miss: great Twitter clients like Twitteriffic, calendar apps like Fantastical, and games like Letterpress. File-syncing apps will take you back to the old Palm-Pilot days. There are plenty of other tiny points of comparison I could highlight, but the main thing I found, after using the Moto G for a while, is that the differences between iOS and Android won’t matter to most people. With an unlocked phone at this price, I wouldn’t hesitate to recommend Android to anyone who is not wedded to the Apple ecosystem. Getting used to Android doesn’t take long, and it’s a mature operating system that does what most people need. I won’t be switching any time soon, however; I have too many apps on my iPhone that I’d lose. And there's still no Letterpress for Android.